While observers of the Iraq War anniversary argue over the scale of the mistake — a colossal folly rooted in imperial ambition and hubris, or simply an error based on faulty intelligence and misplaced fear — the devil is in the details. These numbers, assembled by some of the 29 contributors to the Costs of War Project based at Brown University, help put the past 10 years in perspective. 2 plus 2: Conflicts exacerbated by the Iraq War. Iran and North Korea were apparently not intimidated by the U.S. invasion of Iraq in 2003, nor deterred from pursuing weapons of mass destruction. Conversely, the war in Afghanistan was arguably prolonged by the U.S. invasion of Iraq, and has escalated into Pakistan, with a corresponding increase in military spending and loss of life. 8th: Iraq’s ranking on a scale of corruption. While Iraq has established the formal institutions and practices of a democracy, it was ranked the eighth most corrupt country in the world by Transparency International last year. Middle East Politics expert Melani Cammett of Brown University points to increasing authoritarianism in Iraq, such as the creation of an approximately 6,000 person Iraqi Special Forces para-military force under the direct command of Prime Minister Nouri al-Maliki, the “Fedeyeen al-Maliki.” Nadje Al-Ali of the University of London’s School of Oriental and African Studies (SOAS) finds that women continue to be underrepresented politically, in Iraqi government ministries, and in the labor force, but overrepresented in the population of unemployed, illiterate, and poor. 2.5 and 10 microns: The size of toxic dust particles that soldiers and bystanders have been breathing in Iraq. Soldiers returning from Iraq (and Afghanistan) have elevated levels of respiratory and cardiovascular disease over soldiers returning from other wars. The dust in Iraq has been found to have dangerously high levels of particulate matter measuring 2.5 and 10 micron particles per million (PPM) — too small to be filtered by a human lung. Robert Miller, pulmonary expert from Vanderbilt University Medical School, reports that the dust, sulfur from an early 2003 mine fire and toxic residue from burn pits, is likely to blame for several respiratory disorders among Iraq War veterans, including increased rates of constrictive bronchiolitis. Of course Iraqi civilians continue to live with the dust and other airborne pollutants produced by the war. 84: The number of psychiatrists working in Iraq is fewer than .05 per 100,000 people. After the 2003 invasion, about 18,000 physicians fled Iraq. Some have returned, but in 2012 there were only 84 psychiatrists and about 22,000 physicians for a population of over 31 million people. In separate papers, Mac Skelton and Omar Dawichi of the American University of Beirut found that many Iraqis travel abroad — to India, Turkey, Jordan, and Lebanon — for oncology and surgical care while basic care, such as some childhood immunizations has lagged. 190,000: The minimum documented number of people killed in the war. 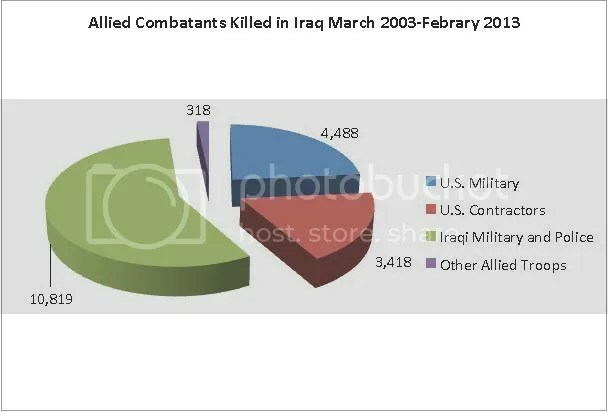 The majority of those killed in Iraq since 2003 have been civilians. The dead also include 4,488 U.S. soldiers, and up to 3,400 U.S. contractors and nearly 11,000 Iraqi police, 318 allied military, and 62 humanitarian workers. But while the numbers of U.S. soldiers killed is known, Catherine Lutz of Brown University shows that we still don’t know the full extent of contractor deaths and injuries. And, as Neta C. Crawford from Brown University discusses, there are disagreements about how many civilians have been killed directly by violence because documented deaths may be a fraction of the actual number of people killed. Further, it is likely that many more have died as an indirect result of the devastation of Iraq’s physical and health care infrastructure. 349: The number of U.S. active duty military suicides in 2012. Ken MacLeish of Vanderbilt University suggests that this toll is not only higher since the Iraq War began, but may climb as the trauma from war often manifests in soldiers years, sometimes decades, after they return home. 2.5 million: U.S. service men and women who have deployed in operations in Iraq and Afghanistan. More than 1.5 million have already left active duty and become eligible for veterans medical and disability benefits. Linda Bilmes of Harvard University shows these veterans are already very sick — with one-third diagnosed with mental health issues. High rates of traumatic brain injury, the need for prosthesis, and musculoskeletal disorders, have put a burden on Veterans Affairs to process all the applications for benefits and treatment of the soldiers. 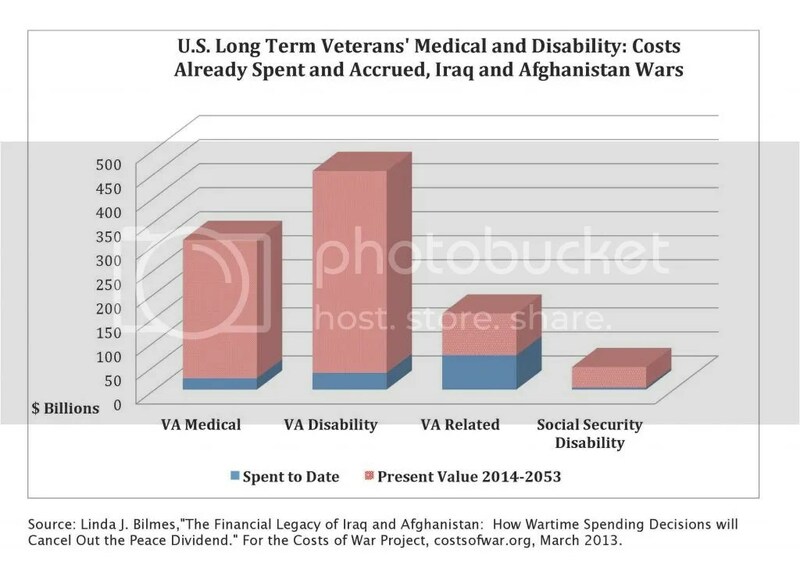 The costs of medical and disability care for the veterans of Iraq and Afghanistan will rise, and Blimes projects they will reach over $970 billion by 2053. $1.7 trillion: The cost of the Iraq War to U.S. taxpayers before adding future care for veterans and interest on war borrowing. Adding anticipated future costs for veterans care, Iraq’s share of the $4 trillion spent and obligated for Iraq and AfPak rises to over $2.1 trillion. The Bush administration estimated the Iraq war would cost $50 to 60 billion. $4 trillion: Cumulative interest on borrowing for Iraq through 2053. The United States did not increase taxes to pay for the wars in Iraq and Afghanistan. Economist Ryan Edwards of Queens College, CUNY calculated only the interest that is due on borrowing to pay for the military and state department costs. Interest costs on both wars will exceed $7.5 trillion. Iraq’s share of Defense Department and State Department war appropriation spending from 2001 to 2013 is 54 percent. You do the math. Many opportunity costs of these wars cannot be enumerated — but there are some lessons that can be drawn. If I had one to impart to the next generation of foreign policy decision makers it would be to remember to balance the tendency to over-estimate the utility of military force with a sober assessment of the risks and costs of action. Those costs always add up. The costs of this war will constrain U.S. possibilities — both foreign and domestic — for decades to come. Neta C. Crawford, a Professor of Political Science at Boston University, is Co-Director with Catherine Lutz of the Costs of War Project based at the Watson Institute for International Studies at Brown University.